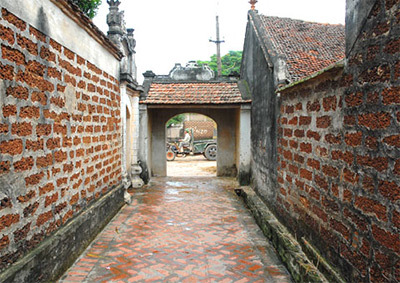 Called an “Ancient laterite village”, Duong Lam commune has become famous for its treasure of valuable tangible and intangible cultural and architectural relics. Like other localities, this ancient commune is also affected by the pressures of urbanization. Therefore, over the past years, the party committee, local authorities and people of Son Tay Town have been trying to preserve and promote the values of cultural heritages in the ancient commune and made their utmost efforts to turn the village into a national level special relic this year. People in Son Tay town and in Duong Lam commune in particular are very proud of their beautiful ancient commune with 50 precious historical, cultural and architectural relics. Many of them have been recognized as national and city level relics. Together with historical relics, such as Phung Hung Temple, Ngo Quyen Temple and 1000-year streblus row, the commune also possesses beautiful architectural projects, especially Mong Phu communal house. Built in the 17th century under Le Trung Hung Dynasty, the house worships Tan Vien Son Thanh, known as Son Tinh. The house includes five compartments, two outbuildings and six rows of big pillars which are carved with dragons, carps, birds, flowers and leaves. Besides, Duong Lam commune is home to 1,000 ancient houses in its hamlets of Mong Phu, Dong Sang, Cam Thinh and Doai Giap, including 37 houses dated from 200 to 400 years and 74 others dated 100 years. One of the most typical is Duong Thi Loan’s house which surrounded by trees, orchards and flowers. The 370-year house includes five compartments and the worship centre. Its floor is tiled with ancient Bat Trang bricks. More importantly, the house still preserves a collection of wood and bamboo sticks which were used by generations of her family to teach their children. In 2005, Duong Lam was the first commune in Vietnam to be recognized as a national level architectural and art relic. The ancient commune is now home to 6,000 people. 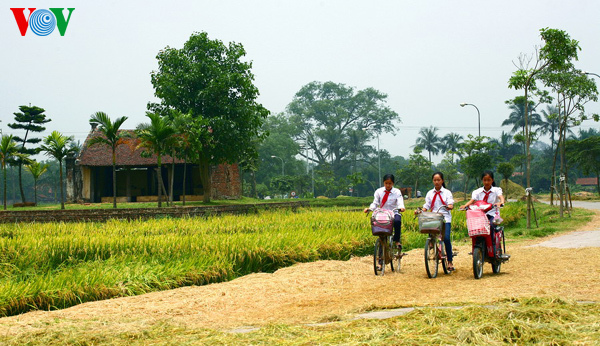 According to Deputy Head of the management board of the ancient commune Nguyen Trong An, there is great pressure on local authorities as more local people want to build more modern houses in the area. To solve the problem, over the past time, together with raising people’s awareness of the values of ancient architectures, leaders of the town formed a board to manage, preserve and improve relics and ancient houses, issued regulations on the building of houses in preservation area in 2007 and built residential areas for local people in an effort to preserve all ancient houses. Mr. Nguyen Trong An added that the commune preservation meets a lot of difficulties, especially financial ones. He stressed that the town needs the support of the central and local organs to preserve its heritage while developing the local economy. On February 12, 2012, the executive party committee of the town issued the resolution on promoting leadership and instruction to manage, preserve and promote values of relics in Duong Lam ancient commune from 2012 to 2020. The resolution also sets the target to make Duong Lam ancient commune more organized as a national special relic this year. According to scientists, Duong Lan ancient commune meets all criteria required by the Cultural Heritage Law to be recognized as a national special relic. This is an architectural and art project marking the development of Vietnamese architecture and art. According to leaders of Son Tay town, the recognition of the commune as a national special relic is important as it not only affirms the values of the ancient commune, but also helps raise people’s awareness of the important role of relic preservation, making contributions to promoting preservation efficiency. Because of its important role, local authorities and people of Son Tay Town are trying to their best to deserve the honour.